“The key thing is to develop the people. You have to have people with a twelfth grade education who are going to be responsible voters, who are going to understand the issues and keep moving the democratic process forward,” said Dr. Paul Brodwin of the University of Wisconsin-Milwaukee’s Department of Anthropology and The Center for Latin American and Caribbean Studies (CLACS) based there. 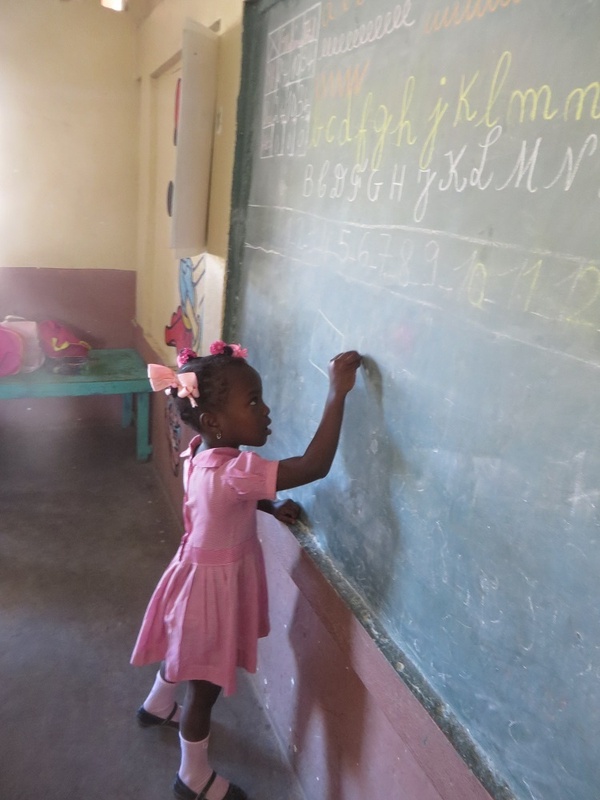 Wiljanka attends classes at a rural Catholic school in Bassin Bleu thanks to Madeline B. who sponsors her through CARITAS For Children's Haitian child sponsorship programs. "My view of Haiti right now is actually kind of optimistic. Haitians in general, Haitian students in the United States – they’re fantastic. Learning is really valued. An immigrant phenomenon [that occurs] whenever you have a bunch of Haitian kids in a New York City school – the Haitians are at the top of the class. 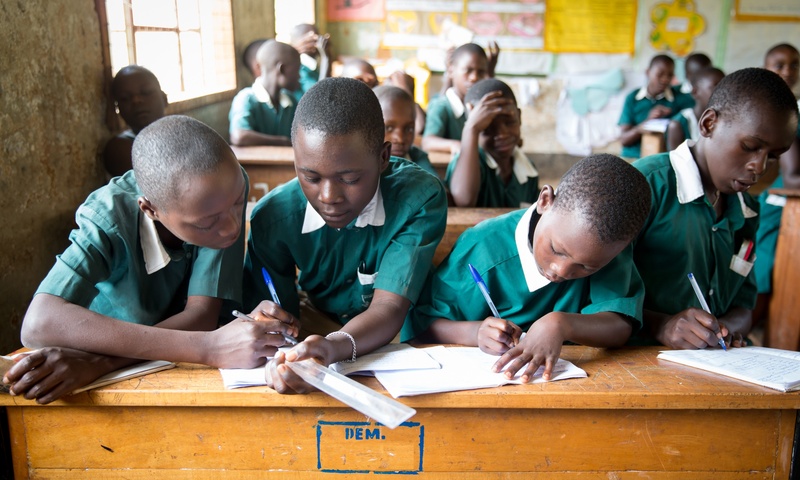 They really, really value learning,” Brodwin said in a continuation of a conversation with CARITAS For Children about Haiti. In considering the steps toward a democratic state and emerging from poverty, Brodwin said it’s important to remember how deeply rooted the problems are. You can find the first part of the discussion regarding that issue in The Roots of Poverty in Haiti. “So what do you have to do to solve the problem of poverty in Haiti? You have to build up the middle class, you have to restore a technocratic class of people, which means rebuilding basic state institutions like universities because you have to educate those people. There are Haitian architects, Haitian engineers, and Haitian accountants, but they all live in Montreal, Miami, or Paris, because under Duvalier, they just had to get out,” Brodwin stated. Another thing you have to do is decentralize wealth and power. Under the dictatorship of Duvalier and his son, wealth and power were concentrated in the city of Port au Prince although the majority of Haitians are rural peasants including many of the children supported through CARITAS For Children’s Haitian child sponsorship programs. CARITAS sponsors help children get an education at Catholic schools in five locations in rural communities in Haiti. Recently CARITAS For Children added a location in Cité Soleil, an area of deep poverty within Port au Prince. Brodwin said the majority of schools in Haiti are Catholic compared to state schools. “I’m impressed by the organizational strength of the Catholic church in Haiti. I think that they were in some ways responsible for mobilizing people to oust Baby Doc. The Pope [John Paul II] visited Haiti in 1983. When he arrived on the tarmac his famous line was, ‘Fòk sa chanje!’ which is Creole for things must change. The Catholic church is one of the major stablizing institutions in rural Haiti," Brodwin said. “You have to have a lot of educated Haitians, at least at the twelfth grade level, in order to be there to receive, and make workable and sustainable all the other international aid that’s flowing in there. You also have to have people with a twelfth grade education who are going to be responsible voters, who are going to understand the issues and keep moving the democratic process forward,” Brodwin emphasized. 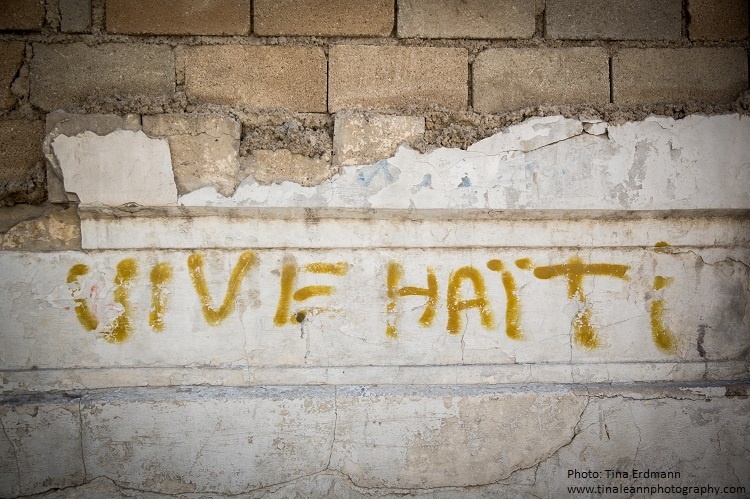 This grafitti on a wall in Port au Prince speaks to the spirit of the Haitian people. There is reason for optimism. “A lot of the Haitian people I knew when I was living there who were involved with anti-poverty programs, they would say, ‘What we just need to do is develop the people.’ That’s more important than building wells, or building another clinic, or sending doctors to do three days of dental work. That’s nice, that’s good, but in the long-term you have to develop the people, make them literate, expose them to ways of thinking, and ways of running a discussion, ways of solving problems in a group; that’s actually the key task,” Brodwin said. Paul Brodwin is a social scientist who neither criticizes nor endorses any particular religious belief. Thoughts and commentary on the article above from CARITAS For Children Founder, Christopher Hoar, compiled by Fr. Richard LoBianco: “Education, empowerment, public and private partnerships, and related efforts can make a valuable contribution in the very long term effort which will be required to rebuild Haiti into a thriving, just and promising land with potential and opportunity for all its citizens, but something more is needed. That more is the very person of Christ made visible and real in our efforts. As a global ministry of the Church, CARITAS For Children believes we can make a valuable contribution in the name of Christ and his Church toward understanding what is needed to build justice across Haiti’s culture, society and land. 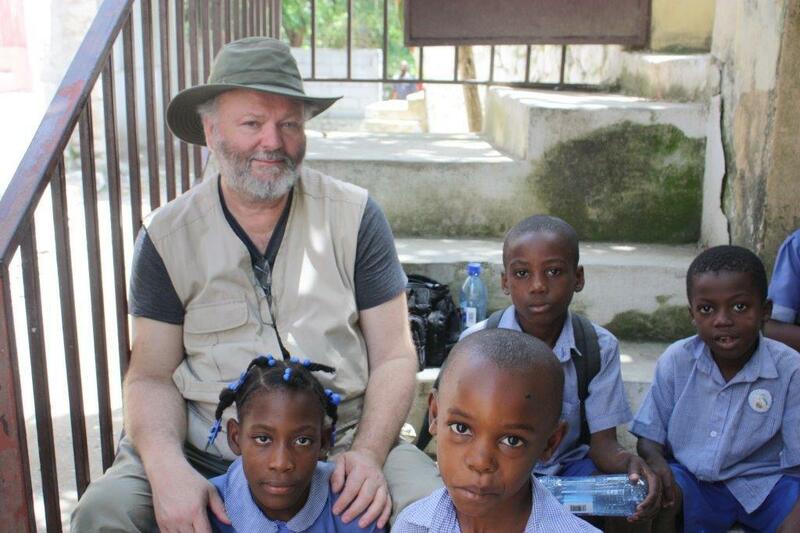 Chris Hoar with Haitian children. Foremost is to begin with love as the motivating principal behind all these efforts, and a specific kind of love – caritas, that gives to the other from the whole heart without seeking recompense or reward, for the virtue of loving in place of God is its own reward. Without this love, the spiritual energy of Christ which accompanies it, and the sacrifice it requires and entails, these efforts remain solely society’s attempts to bring about a better world through material help and human development. With divine love at the center, the spirit of a person – their very soul, is offered refreshment and care, which is always our ministry’s aim, which seeks to empower the entire person, physically, emotionally, and spiritually. Christians everywhere live the paschal mystery daily. In almost no other place can this be seen more clearly than in Haiti, where the cross of day to day survival and deep and pronounced suffering gives powerful witness to the Cross of Christ, upon which the courageous of this land place their wounds, to be healed and made whole in the Resurrection of Christ, whose love, when shared, makes Him real and visible again among us. Read Chris Hoar's thoughts on the work of CARITAS in Haiti as told by Kollin Petrie: History of CARITAS For Children in Haiti.